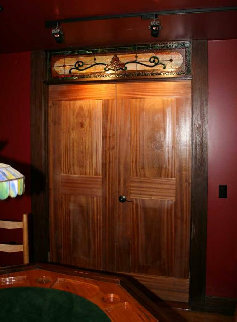 Jim was renovating his home in Shelburne Falls, Massachusetts and wanted a transom for his home. He had built a set of french doors leading to a room in his art gallery. He sent me a picture of the doors with a picture of Julianne's Transom superimposed as a starting point for our design. On my transom design page, Jim liked the vines in Greg's Transom and the earth tone colors in Julianne's Transom. After a few phone conversations, we roughed out a design and I emailed it to him for some tweaks. After a revision or two, I sent him a full size drawing for his approval, and we started construction. Jim's Transom is classic Victorian in style and certainly bold in it's colors. Jim didn't seem to be a "shy & retiring" sort of guy, so I think this dramatic transom will fit the personality of his home nicely. 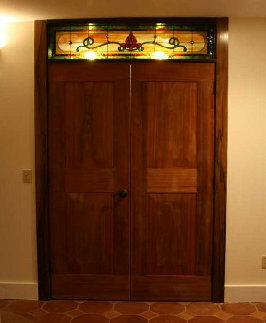 Jim's Transom measures 12" x 55", contains 133 pieces of glass, and was finished in February, 2008. Jim sent me pictures of his transom after installation. Note the beautiful doors Jim hand made himself. They are constructed of Sapele wood from Africa, a wood very similar to mahogany. The poker table in the right picture was made by Jim with salvaged fir from pickle barrels from a local plant. I am awed at the beautiful work done by some of the people that I build stained glass for.